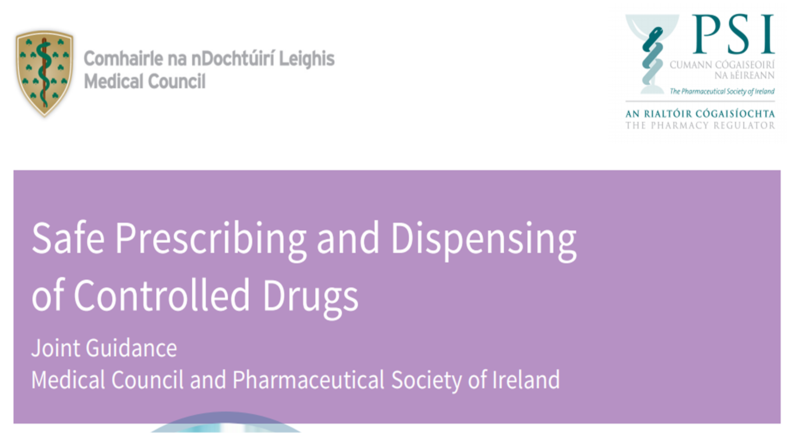 The Medical Council and the PSI, the pharmacy regulator, have launched a joint initiative aimed at doctors and pharmacists, entitled ‘Safe Prescribing and Dispensing of Controlled Drugs’. European legislation for aseptic manufacturing is developed with a particular focus on the pharmaceutical industry. With certain exceptions, manufacturers of human medicines are required to hold a Manufacturer’s Authorisation. To obtain an authorisation to manufacture medicinal product, compliance with the principles of Good Manufacturing Practice (GMP) must be demonstrated. Aseptic compounding in Irish hospital pharmacy is exempt from holding a Manufacturer’s Authorisation provided certain criteria are met (Medicinal Products (Control of Manufacture) Regulations, 2007. Section 5 – S.I. No. 539 of 2007). However, the ethos of GMP is equally paramount to ensure that all products compounded are of high quality, safe and effective. It is important, therefore, that the underpinning principals of GMP can be translated transparently and safely into the hospital pharmacy aseptic compounding unit. 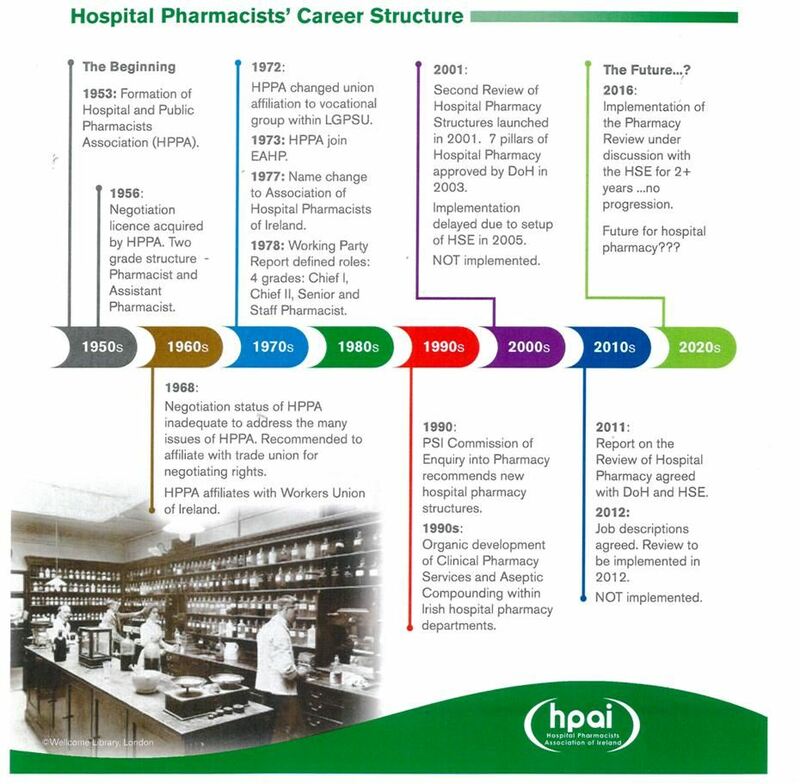 In the absence of nationally agreed guidelines for aseptic compounding in Irish hospital pharmacy the Hospital Pharmacist Association of Ireland (HPAI) submitted a project to develop guidelines to the Medication Safety Forum in 2010. All pharmacy departments with compounding facilities were invited to contribute. Through consultation with the Health Information and Quality Authority (HIQA) and the Irish Medicines Board (IMB), the Pharmaceutical Inspection Convention and Pharmaceutical Inspection Co-operation Scheme (PIC/S) Guide to Good Practices for the Preparation of Medicinal Products in Healthcare Establishments (PE 010/3) was chosen as the most appropriate guidance to apply to aseptic compounding in Irish hospitals. These guidelines were written by pharmacists working in aseptic compounding and reflect a consensus of the combined knowledge of these pharmacists. They are guidelines of professional practice as developed by practitioners and have been endorsed by Chief Pharmacists (Head of Departments) on 7th March 2013 and by the HPAI Executive on 7th November 2013. What Does the Hospital Pharmacy Review mean for me? now deemed to be Superintendent Pharmacists operating a retail pharmacy business. must be negotiated by Pharmacy Managers; this is not helped by reporting structures which often mean the “owner” is many steps away in a complex management chain. It is welcoming to see the development of pharmacy services and regulation to improve the breadth and quality of services we provide to our patients. However Pharmacy Managers should not be expected to operate in an environment where they are unsupported and unrecognised by management. Hospital CEO or General Manager, thus facilitating meaningful engagement between superintendent and owner. The Review also provides for a rotational Area Director role, platform for Pharmacy Managers in different hospitals to work collaboratively for the betterment of patient care. As noted above the development of Deputy Director will relieve some of the operational pressures faced by Pharmacy Managers. Chief II Pharmacists currently operate in a variety of roles including clinical specialities, service managers and heads of departments. The role varies considerably between and within hospitals; often these posts have grown organically out of the 1978 job description, and the roles currently undertaken are far more complex and nuanced than when they were first established. For example an Aseptics Chief II is tasked with managing an Aseptic Unit, which in itself carries considerable responsibility, but they may also have responsibility for clinical trials, cancer clinical services, cancer drug procurement and reimbursement, protocol development and electronic prescribing. Medication Safety Pharmacists are tasked with managing their hospitals medication safety programmes but are usually involved in much broader aspects of medicines management, and are often expected to operate at a Regional and National level. The Hospital Pharmacy Review will better define the role of Pharmacists working at Chief II level. It will establish Pharmacy Service Managers in areas such as Dispensary, Aseptics and Clinical Services; these posts will provide appropriate recognition for the considerable responsibility associated with these roles. The establishment of the Deputy Director of Hospital Pharmacy post will allow Pharmacy Service Managers to focus their attention on the operational needs of their service rather than being pulled to cover administrative and management functions outside their remits. Chief II Pharmacists have been expected to operate in an ever expanding and complex health service without any progression in their job description or definition of their responsibilities. The Hospital Pharmacy Review must be implemented so Chief II pharmacists receive the due recognition they deserve and are given the operational freedom they need to manage their service with the patient as their primary focus. At present there is no formal route to specialisation in Hospital Pharmacy; this is in contrast to many of our professional colleagues in Dietetics and Physiotherapy for example who have a clinical specialist grade. This means that many highly qualified (77% of hospital pharmacists hold a related post graduate qualification) and experienced pharmacists are working as unrecognised, and often underutilised, specialists in clinical areas. The Hospital Pharmacy Review recommends the establishment of a Clinical Specialist Pharmacist grade; this reflects the contribution Hospital Pharmacists make to patient care in complex and key specialities. What is the Report on the review of Hospital Pharmacy? What is the Hospital Pharmacy Review? The Hospital Pharmacy Review (sometimes known as the Career Structure Review) was published in November 2011. The review aimed to create a structure for Hospital Pharmacy to best facilitate a consistent delivery of pharmacy services in line with best practice and recognised international standards. The current structures and grades, Basic, Senior, Chief II and Chief I were implemented in 1978 and in no way reflect the current complexity and specialist knowledge that is required to manage medicines in a modern hospital. In 1986 the HPAI notified Health Service Management of the need to conduct a new review in order to match changes in practice in European countries and further abroad. The Review itself suffered much delay. In 1990 the PSI launched their “Commission of Inquiry into Pharmacy” which recommended a career structure overhaul. Unfortunately there was no restructuring after this report, however the 1990’s saw Hospital Pharmacists introduce specialisations that had a profoundly positive effect on patient safety and cost effectiveness. These specialisations included clinical pharmacy and aseptic compounding. In the next decade, specialisations were extended to include medication safety pharmacists and antimicrobial pharmacists. In the last decade, IT developments, cluster pharmacy services and automation projects, although isolated, emerged within hospital pharmacy and pointed to the next generation of creative developments. reviews, such as that of hospital pharmacists, where service improvements were involved. Further delays were however incurred due to the establishment of the Health Service Executive (HSE) on January 1st 2005 and the commencement of the Pharmacy Act on the 22nd May 2007. In late 2009, Dr. Ambrose McLoughlin was appointed as Chair of the Review of Hospital Pharmacy. 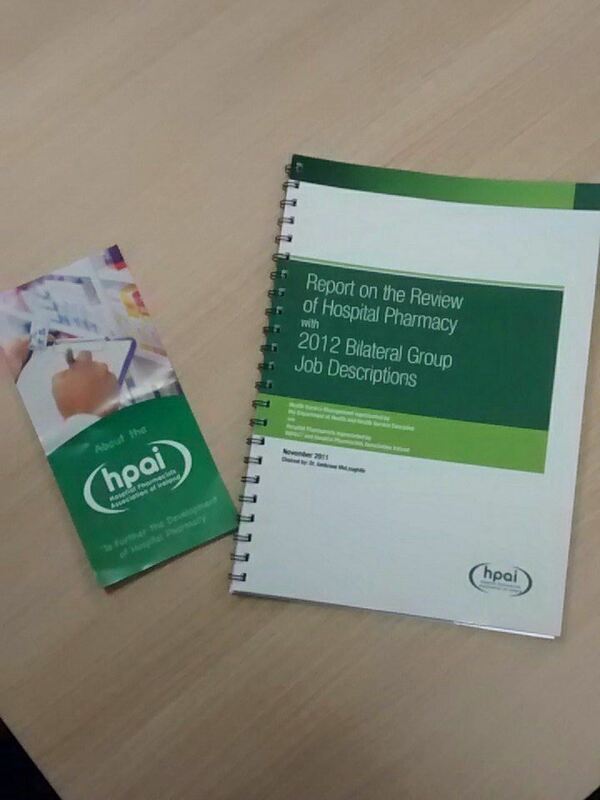 In December 2011 the Hospital Pharmacy Review was signed off by the HSE and the HPAI and the expectation was that the Review would then proceed to implementation. However, despite the repeated efforts of the HPAI negotiation team, not a single aspect of the Review has yet been implemented. The career structure implementation is badly needed - pharmacists are working as specialists without the commensurate support and recognition. The path has been long and challenging, here is a roadmap of the journey. The HPAI conference is a showcase of the work of Hospital Pharmacy - new ways of working, successful changes, patient outcomes impact, audits and research. A great opportunity to network with friends and colleagues from hospitals around Ireland. Why did you join IMPACT? In order to join the HPAI as a member you must also be a member of the IMPACT union. Please see more information on IMPACT both here on our site and on the IMPACT main site. In order to give more information on the benefits of IMPACT membership a recent video has been produced.